At least 165 Israeli professors have declared a boycott against a contentious Israeli college in the West Bank, organizers said Sunday, deepening an internal rift in Israel over the expansion of West Bank settlements. The academics signed a petition stating they are unwilling to partake in any activities at Ariel University Center. They said Ariel is an "illegal settlement" intended to prevent Palestinians from establishing an independent state. Ariel, a settlement of 19,000 people, lies deep inside the West Bank. Palestinians claim all of the West Bank, which Israel seized in 1967, as part of a future independent state. "Ariel is not part of the sovereign territory of Israel, and we therefore cannot be required to go there," the petition reads. The continued growth of Jewish settlements is at the heart of the current impasse in Mideast peace efforts. The latest round of peace talks broke down in late September after an Israeli freeze on most settlement construction expired. Palestinians refuse to negotiate while Israel builds homes for Israelis on captured territories the Palestinians claim for a future independent state. Some 300,000 Jewish settlers live in the West Bank, in addition to 200,000 Israelis living in east Jerusalem. Professor Nir Gov of the Weizmann Institute of Science, who organized the boycott, said the goal is not to punish the college's student body - which includes many Arabs - but to hasten the end of the occupation. "I have two young daughters and I want them to grow up in a democratic, free Israel," Gov said. "The occupation of millions of Palestinians without any human rights is really destroying it." Gov added that others have declined to add their names to the petition for fear of retribution by Israel's right wing. The move was opposed by an umbrella group of Israeli university presidents and the hawkish political party Yisrael Beitenu. Ariel Mayor Ron Nachman told Israeli radio that the more academics boycott, the more he will build up the settlement. Israeli academics themselves have been subject to boycott calls from colleagues in Britain and Spain. Israeli officials have angrily said such efforts are counterproductive and go against the ideals of academic freedom. In 2010, more than 150 Israeli artists boycotted a new performing arts center in Ariel. Also, hundreds of professors signed a petition opposing the college's upgrade to university status. 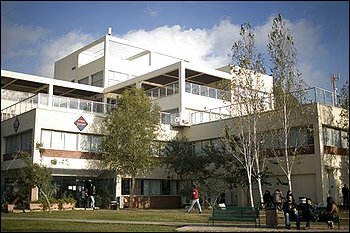 The University and College Union, representing approximately 120,000 teaching and related staff in colleges and universities in the UK, has passed new policies supporting boycott, divestment and sanctions (BDS) against Israel. Alert 6th Oct 2017 - Protest Apartheid Bank Leumi - UN Blacklisted Illegal Settlement Profiteer Out Of Our City! On 6th Oct 2017, Inminds will protest outside the UK headquarters of the Israeli Bank Leumi that has been blacklisted by the United Nations Human Rights Council for violating international law by profiteering from Israel's illegal settlements built on stolen Palestinian land. Twenty-six former European Union leaders, including the EU’s former top diplomat, Javier Solana, issued a letter last week calling for boycotts and sanctions targeting Israel due to settlement construction. Coop Italia and Nordiconad have announced that they will stop selling all Israeli products as they can not differentiate whether they came from West Bank settlements or inside the Green Line. Ameer Makhoul, the general director of the Palestinian NGO umbrella group in Israel, Ittijah, one of the key backers of a new Palestinian boycott on settlement goods has been arrested by the Israeli secret police, the Shin Bet. The British Trade Union Congress are today calling on consumers not to buy goods from illegal Israeli settlements. Revelations of some of the companies trading in the illegal Israeli settlement of Ma’ale Adumim and Bnei Yehuda - Lee Cooper, Tower Records, Western Union, Dr Fischer and Carmel Agrexco. On Thursday 24th May 2018, Inminds Human Rights Group will protest against the grotesque celebration of the 70th anniversary of the settler colonial apartheid state of Israel. 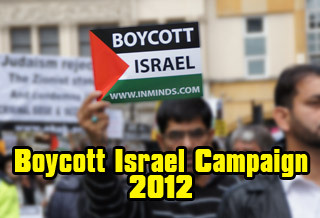 On 11th Nov 2011, at University College London, renowned political analyst Prof Norman Finkelstein and Prof Jonathan Rosenhead, chair of BRICUP, discussed Boycott, Divestment and Sanctions (BDS). Full video and photo report. Benny Morris - historian or plain old racist? On 14th June 2011 activists opposed the visit of Israeli historian Benny Morris to the LSE. He is known for his racist views of Arabs and Muslims, his support of ethnic cleansing and his justification of genocide. Video report. Seminar on 'Why Academic Boycott of Israel'. Speakers included Mohammed Abuabdou, the founder of the Palestinian Students Campaign for the Academic and Cultural Boycott of Israel, Mike Cushman (BRICUP) and activist Jody McIntyre. Report includes full video. 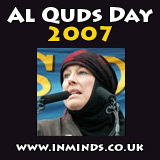 "Today is Al-Quds Day, it was started by Ayatullah Khomeini, one of the first things he did after the Iranian revolution was to impose boycotts and sanctions on the apartheid state of Israel and the apartheid state of South Africa. South Africa's apartheid state is history, now we have got to turn on the apartheid state of Israel - we have to impose our own boycotts.."